Ukrainian supermarkets have imposed rationing of basic products after the drastic fall in the value of the hryvnia. The currency has lost 70 percent of its value causing people to stockpile food and buy electronics as a hedge. Restrictions apply for goods such as cooking oil, flour and sugar, Ukraine’s news agency UNN reports Wednesday. Retailers may sell no more than two bottles of sunflower oil, and two packs of buckwheat per customer and, depending on the store, from 3 to 5 kilograms of flour and sugar. Bread, rice, potatoes, meat and milk are not yet rationed, but are not so plentiful on supermarket shelves. Stores have also see higher demand for household appliances, as people consider consumer electronics an investment as prices increase on a daily basis, RIA reports. 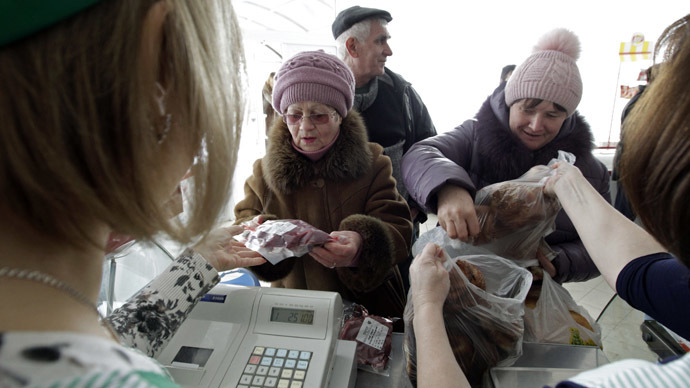 Inflation in Ukraine is expected to reach 27 percent by the end of 2015. The rush to buy was triggered by the dramatic depreciation of Ukraine’s hryvnia which lost 70 percent of its value against other currencies in just a year. The conflict in Eastern Ukraine and international reserves only enough to last for two months, are among the key reasons for the hryvnia’s fall. The devaluation accelerated after the National Bank of Ukraine (NBU) let the hryvnia free float in early February. Ukraine is currently in a deep political crisis reflected in its economy and budget. The country is balancing on the brink of default. Prime Minister Arseny Yatsenyuk says Ukraine’s task for 2015 is “to survive” and that all people would face tough challenges no matter what their place in society. According to the NBU the country’s GDP plunged by 7.5 percent in 2014. The official exchange rate set by the National Bank for February 24 is 28.29 hryvnia to the dollar and 31.96 to the euro. Exchange offices sell the dollar at more than 40 hryvnia and the euro at about 50. In an attempt to stop the currency’s free fall the National Bank of Ukraine stepped up its currency controls Wednesday, preventing banks from buying any foreign currency for clients this week and limiting what they could buy for themselves. Prime Minister Arseny Yatsenyuk criticized the decision saying it doesn’t add stability to the Ukrainian economy. "This morning I learned that the NBU on its own, without consultation, decided to close the interbank market that surely doesn’t add stability to hryvnia," he said talking at Wednesday’s Cabinet meeting. Meanwhile Ukrainian President Petro Poroshenko called for the head of the NBU Valeriya Gontareva to "stop messing with the exchange rate” and gave her a week to solve the issue, Ukrainian media reported Wednesday.